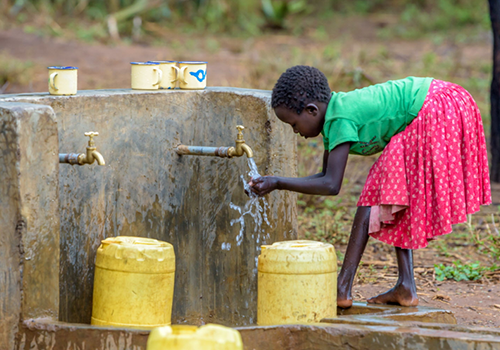 In the northern Kenyan community of Kesot, clean water rushes from a gravity-fed water pipeline system. A hilltop dam protects and diverts spring water and the pipeline—which community members helped build and now maintain—delivers it to homes and the three primary schools. Students can attend class because they spend less time gathering water; and because the schools are outfitted with large water tanks, spigots, latrines for boys and girls of differing abilities, and hand-washing stations. This system will last because the community owns it—the water committee collects user fees to perform maintenance and operations. The WASH UP! program trains educators and community leaders to use play-based learning materials to teach children about good hygiene practices. This goes a long way to reduce water-related disease like diarrhea, cholera, and other sickness. On their way to become health superstars, students play games and activities featuring Sesame Street’s Elmo and 6-year-old Raya. It helps children identify healthy hygiene habits, such as washing hands with soap and how to use the restroom. World Vision and Sesame Workshop pioneered this program in rural Zambia. Together we plan to reach 880,000 children in 16 countries by 2020. That number of children is equivalent to nearly all the public school students in Colorado. The eight-year war in Syria has displaced millions of people—half of them children. Damaged or destroyed water pipelines and sanitation systems have left families vulnerable to sickness and disease. World Vision rehabilitates critical water infrastructure, like pipelines, pumps, storage tanks, and taps, in hard-hit areas. 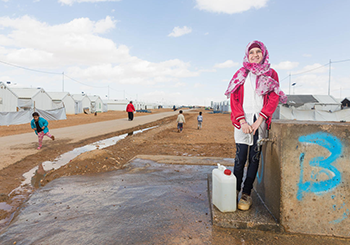 We provide clean water and sanitation facilities to Syrian refugees and hygiene education to refugee children in Jordan, Lebanon, and Iraq. By 2020, our goal is to reach 6 million people affected by the crisis with clean water and provide 200,000 people with functioning sanitation and hand-washing facilities. 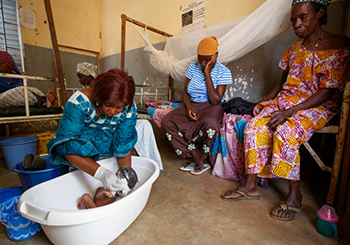 In Mali, 1 woman in 27 has a chance of dying during childbirth over her lifetime—compared with a 1 in 3,800 chance in the U.S. Clean water and improved sanitation at medical facilities are critical for patients and workers in efforts to prevent spread of diseases. Facilities in rural, developing areas often lack the necessities like running water, functioning toilets, and hand-washing stations. That’s why World Vision prioritizes efforts to drill borehole wells, provide necessities, and train health workers in Mali and in dozens of other countries. Even the smallest of improvements lead to cleaner facilities and better outcomes for mothers and babies. 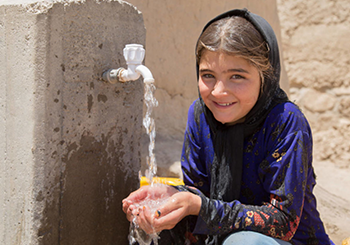 Bringing clean water to a community in northwestern Afghanistan is improving children’s health and education, strengthening the community, and helping protect the environment. Water is contaminated and dangerous to drink in Badghis province’s Ab Kamari district. World Vision and local leaders have devised an innovative solar-powered, reverse-osmosis filtration system to bring clean water to residents. It removes most bad chemicals and bacteria by pushing pressurized water through a filter. The system produces up to 1,135 gallons of clean drinking water per hour and serves 700 households - about 4,900 people.